In recent years, students from an early primary school level up until VCE level have embraced the Educational Programs offered by the Greek Community of Melbourne, which continues to offer programs that strengthen and promote the quality of teaching and learning practices hence ensuring high level outcomes in the teaching of the Greek Language. During this period, the Greek Community of Melbourne has expanded its education jurisdiction which now includes: Creative Drama, Ancient Greek for secondary students, Greek language courses for adults and advanced Greek for both primary and secondary students who have Greek as their primary language. In 2018, considering Melbourne’s changing demographics, 3 new campuses of the Greek Community of Melbourne’s Language and Culture Schools commence operation in the outer suburbs of Narre Warren, Point Cook and South Morang, thus providing students who live in these remote areas the opportunity to study the Greek language and culture. The language and culture programs offered by the Greek Community of Melbourne continuously evolve in order to facilitate quality improvement in language education. New initiatives such as on-line peer mentoring programs with students in Greece, participation in research programs aiming at enhancing spelling and reading skills promote the educational, cognitive, social and other benefits of learning the Greek language. With the introduction and development of new curriculum material, our new education programs aim to further develop the critical and analytical thinking of our students in a flexible learning environment. 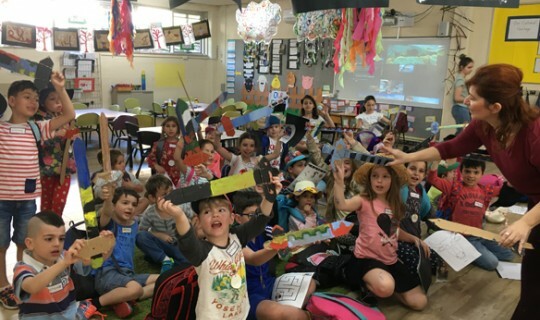 In 2017, a new initiative, the School Holiday Program, was introduced; it offers a unique opportunity for students aged 4 - 11 to connect with the Greek language and culture through play and creative activities, such as playing traditional Greek games, creative reading, cooking, traditional Greek dancing, singing, art and crafts and much more. The professional learning of our teaching staff is a priority for the Greek Community in order to achieve and to further enhance the quality of teaching. Initiatives such as introducing creative drama techniques and activities, the use of technology, differentiation in the teaching of the Greek language, modern approaches in teaching grammar, vocabulary, pronunciation and the development of oral skills are some of the ongoing professional learning programs that develop understandings of inter-cultural language learning and curriculum design. In 2017, as part of the initiative of the Greek Community of Melbourne's Education Office to embrace all educators and to enhance the teaching of Greek in Victoria, a new professional learning and development programme was organised with the collaboration of Professor Michael Tsianikas of Flinders University. The theme was "Literature and texts in the teaching of Greek". Staff from our Greek Community of Melbourne's Language and Culture Schools presented various methods and examples of teaching literature from their own classroom experience. The achievements of our students in the VCE exams were remarkable for another year, reaffirming the long-established tradition of excellence in teaching and learning. Six (6) of our 2017 VCE class excelled in the subject of Modern Greek with a score of 40 and over. It is worth noting that the performance of the rest of the students was also very rewarding, which is evidence of the hard work they have put in over many years, the quality of the program, the commitment of our staff and the nature of our pedagogical approach. Also outstanding was the performance of our students in the subject of Classical Greek with one of our students achieving the second-best score in Victoria (41/50)! The whole class also achieved exceptional scores in the subject making it a very strong set of results for the Greek Community of Melbourne's Language and Culture Schools. For more information and for enrolments, please refer to our website: www.greekcommunity.com and click on the Education tab.